I have a set of buffers as arrays so I can have multiple objects in my scene. I tried making multiple calls with drawelements in a loop but all I get is a black screen that flashes. Do you know what I'm doing wrong or if there is a better way of loading multiple objects in a scene? It's difficult to guess without looking at your source code. Do you use VBOs? Do you bind them correctly? _gl.glGetError(); // flush error .. Yes. I was right, call glBindBuffer before each call of glDrawElements. You seem to use the latest bound VBO. How do I go about calling bindbuffers? I have two sets of buffers, one for one model one for the other as you saw in my code. So do I call bind buffers on all four before I do drawelements or just one of them? You have to use GL_ELEMENT_ARRAY_BUFFER for the indices (instead of GL_ARRAY_BUFFER). You must use GL_ELEMENT_ARRAY_BUFFER only for the indices, not for the rest (colors, texture coordinates, ...). The message isn't cryptic, you call glVertexPointer with no VBO bound to the expected target. So you use glVertexPointer on the indices as well? but there is no gl.glIndexPointer for the indices. So am I to use glVertexPointer? glIndexPointer exists and is available in JOGL. This solution works, I remember that gmseed contributed to JogAmp's Ardor3D Continuation, I provided the very first blueprint of our STL importer. 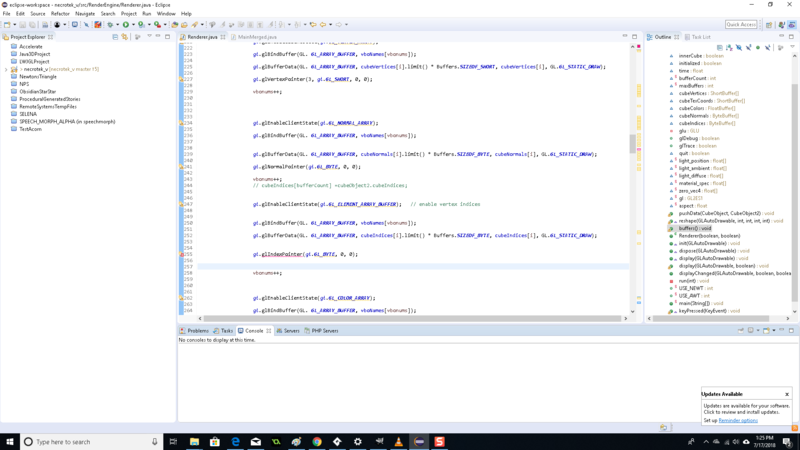 If it still doesn't work, I'll look at my own source code again as I use indices elsewhere with VBOs. A NIO buffer is typically an instance of this class. A direct NIO buffer is a buffer whose content resides (most of the type) outside of the Java heap in the native heap. You can create NIO buffers to use with JOGL by using this class. I advise you to read my post about deallocating direct NIO buffer native memory. By the way, if you pass an indirect NIO buffer to JOGL, it will have to build a direct one anyway, it's not a good idea. You no longer need glIndexPointer if you follow gmseed's example.